Please use the search functionality on the home page of our website or phone app to get help with a wildlife emergency or "nuisance" wildlife issue anywhere in the United States. AHNow provides resources on this page for both wildlife and domestic animal issues. The resources below may be used to supplement your search for help or guidance. Need a quick video on moving a snapping turtle across the road? You'll find it here. In addition, this page contains valuable and effective tips on how you can help make the world a better place for our animal friends. Where does Animal Help Now get its data? Very few helpers are showing up in the results. The helpers I contacted were unhelpful. When I click an email address in a helper's listing, nothing happens. Animal Help Now gleans the bulk of its data from state and federal wildlife rehabilitation licensee lists. Because these lists can change at any time, AHNow continuously updates this information (i.e., literally every week). In addition, AHNow provides wildlife rehabilitators with the ability to update their data. AHNow also maintains data on wildlife hotlines, wildlife agencies, and veterinarians who accept wildlife, as well as other agencies, organizations and businesses that have proven to be helpful during wildlife emergencies. As of late 2017, AHNow also maintains data on humane wildlife conflict resolution professionals. Animal Help Now does not simply track the names and numbers of these various helpers. The organization strives to gather and maintain additional important information, including the types of animals the helper accepts/assists, the helper's hours of operation, the helper's preferred contact method, etc. By providing this extra information, AHNow seeks to ensure that wildlife emergencies and conflicts are resolved as quickly and effectively as possible. AHNow regularly contacts helpers to ensure their data is complete and current. To apply for listing on Animal Help Now, click here. Animal Help Now provides you with a list of all the helpers we know about in your area. We list helpers whether they are open or closed. Please respect helpers’ privacy – especially at-home wildlife rehabilitators – by not calling outside of published hours. Regretfully, animal emergency services either are limited or simply do not exist in many areas. See below for suggestions on how to find hard-to-find help! If few wildlife helpers are in your area, contact local veterinarians to ask if they are willing to stabilize and/or hold wildlife until a wildlife rehabilitator/transporter can be located. To find vets in your area, Google "emergency veterinarian". Your local animal control agency or animal shelter also may be willing and able to assist. To find animal control agencies and animal shelters in your area, Google "animal control” or “animal shelter". I need help with a wildlife issue but I am not in the United States. I need help with a domestic animal issue. If the helpers you contacted were unhelpful, we suggest you follow the advice provided in the FAQ above to exhaust all options. If you still do not get the help you need, consider contacting an advocacy organization, several of which are listed near the bottom of this page. As a last resort, you can contact us, but we are not always able to respond quickly and we cannot guarantee we will be helpful. This problem is related to your browser (Chrome, Internet Explorer, Safari, etc.) and not specific to Animal Help Now. Talk to your system administrator or search "mailto not working in [browser name]" for further assistance. I found a baby owl, hawk or eagle. What should I do? I found a baby mammal. What should I do? I found a baby squirrel. What should I do? What do I do if I find a bat? How do I tell if a wild animal is orphaned or if the parents are simply out of sight? Should I try to reunite a baby animal with his or her parents? If so, how do I go about it? A bird has struck my window. What should I do? An injured deer needs help. What should I do? An animal appears to have mange. What can I do to help? Should I try to rehabilitate a wild animal? What should I do about a wild animal who is habituated to humans? How do I capture and transport a wild animal? Can I get help transporting wildlife? For assistance with wildlife emergencies outside the United States, check the other resources on this page (including this FAQ) and visit this International Wildlife Rehabilitation Council page. In Australia, visit WIRES (NSW Wildlife Information, Rescue and Education Service Inc.) for contact information, or download the WIRES Rescue App for Android or Apple. You can also try contacting your local or federal wildlife agency. For assistance with wildlife conflicts, check the other resources on this page (especially in the Wildlife section and the Other Helpful Resources section). Often, well-meaning humans unintentionally take healthy young raptors away from their parents. If you found a baby owl, hawk or eagle and the bird appears to be uninjured, reuniting the baby with his parents is the best approach. If the baby is healthy, visit Reunite Raptors for detailed information on returning the baby to his parents. 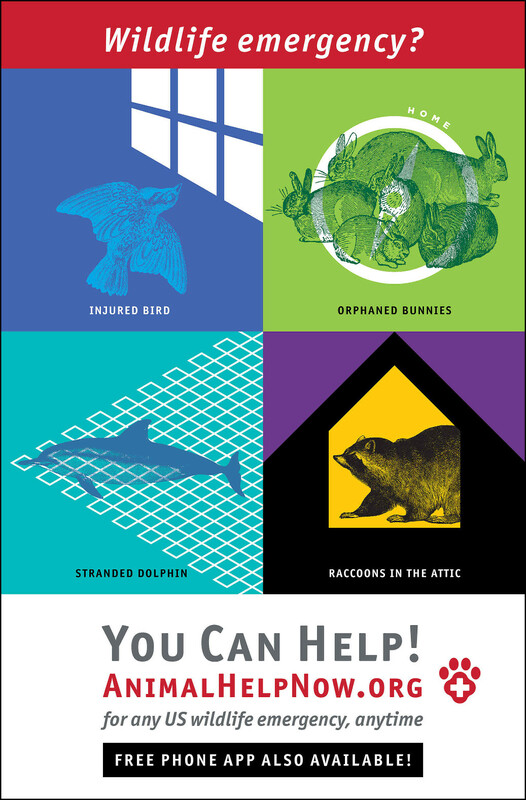 If the baby is injured or if you are unsure, use Animal Help Now to find the nearest wildlife emergency professional. Do NOT handle the bat with bare hands. To do so could jeopardize your safety as well as the life of the bat. And unless absolutely necessary, do not handle the bat before getting this guidance from the Bat World website. 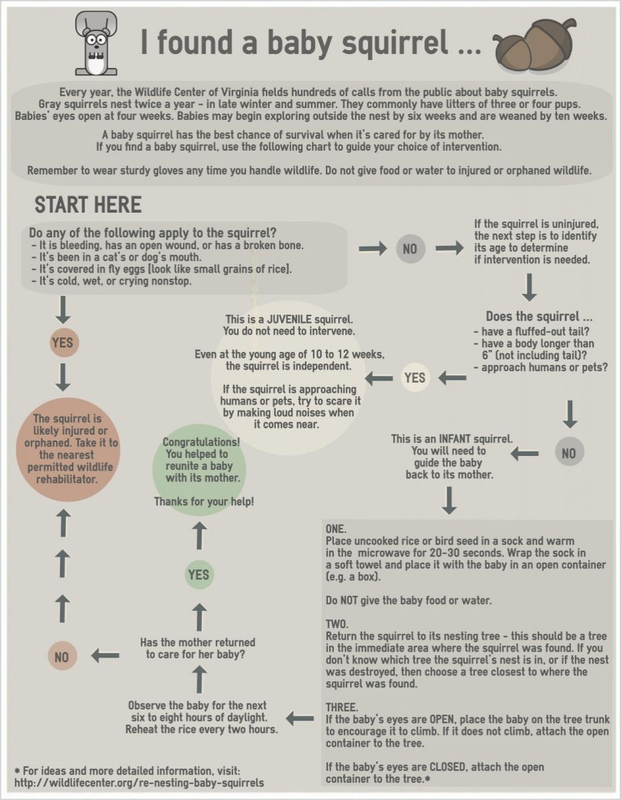 Always remember that baby wild animals left alone for long periods of time (up to 14 hours) may not have been abandoned. Do not interfere unless you are certain the animal has been abandoned or separated from her mother. Rabbits have very large digestive organs that store enough milk that the mother returns just twice each day to feed her kits. Other animals may exhibit similar behavior. If the mother is confirmed dead or the baby animal is covered with blood or insects, has been caught by a cat, dog or wild animal or is cold, use Animal Help Now to contact a nearby wildlife rehabilitator. The baby animal is not ill, injured, or orphaned. At least one parent is still in the area. You have been given the go-ahead from a wildlife rehabilitator or other wildlife expert. Use Animal Help Now to find local wildlife experts. Carefully put him in a shoe box with air holes and a clean, tight-woven cloth like a T-shirt lining the bottom. Keep him in a quiet place away from any other animals, and keep him warm so he doesn't go into shock. Do not attempt to give him food or water. Use Animal Help Now to find the nearest emergency assistance. Note: Even if a bird flies away after striking a window, he may die elsewhere as a result of his injuries, so it’s best to seek medical attention. 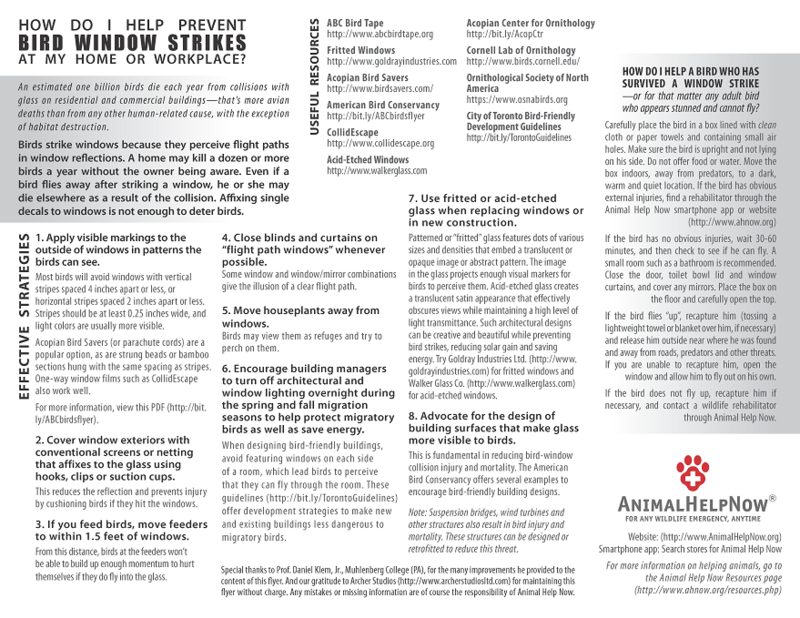 Read this document to find out what you can do to prevent bird window strikes. Adult deer don't handle the stress of capture and captivity well, and attempts to treat an injured adult deer typically will do more harm than good. If the deer can walk and is in a relatively safe place, simply leave the deer alone. If she cannot stand, euthanasia is likely the most humane option. In either case, do not approach the deer—an injured and scared deer could easily injure you or make her injury worse. If she is severely injured or near a busy road, contact a wildlife emergency professional through Animal Help Now for advice, or call 911 or Animal Control. For more information, see Native Animal Rescue’s deer page. Please read this document for guidance on helping an animal afflicted with mange. Never attempt to rehabilitate wildlife by yourself. As a rule, you must have a license to treat wildlife. Rehabilitating wildlife without a license often places undue risk upon the animal. Animals have very specific needs that often only the experts know and can accommodate. Still, a situation may require that you provide short-term, temporary care for an animal in need. For specific instructions based on the type of animal, please see the Greenwood Wildlife and Rehabilitation Center website. If the animal lives in the wild, first and foremost be sure to eliminate any food sources that may be attracting the animal. Observe, too, to ensure the animal does not have dependent young. When food sources have been removed and the possibility of dependent young has been eliminated, hazing is often the most humane way to help. If you need advice, go to our home page and click Wildlife Conflict. If the animal lives with humans - for instance, if a human family made the mistake of adopting an orphaned baby raccoon - the chances of positive outcomes are slim. Most U.S. states prohibit keeping wildlife in human homes, and many states require the killing of wild animals who are habituated to humans. We recommend you educate yourself. This will give the animal his or her best chance at a positive outcome. Do some web research to find out how your state handles captive wildlife. You can also contact nearby wildlife rehabilitators for their advice. To find nearby rehabbers, go to our home page and click Wildlife Emergency. Always remember to exercise safety and caution when helping animals. Even though your intentions are good, many animals – especially wild ones – may perceive you as a threat. Understand that approaching an animal without proper preparation can result in injury to yourself and/or bring further harm upon the animal. Whenever possible, consult the experts we direct you to before approaching or handling an animal. Their understanding of animal health and behavior has the power to spare you and the animal both trouble and harm. If you are unable to reach an expert, please refer to the instructions provided by Greenwood Wildlife and Rehabilitation Center for the most appropriate way to capture and transport an animal. If you do not have access to the internet, brief capture and transport instructions are provided below. Here's a quick video on capturing injured opossums. 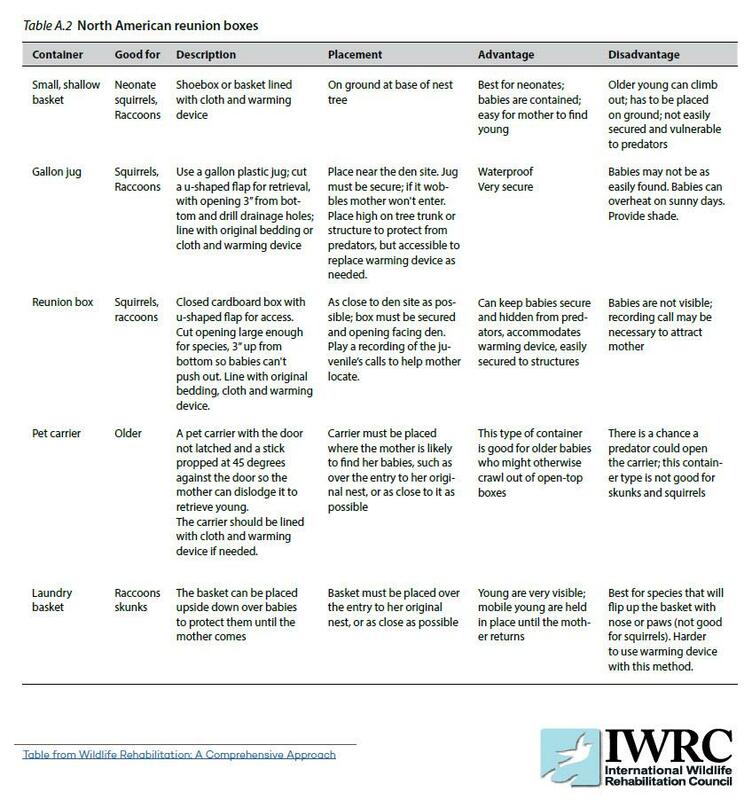 And here's a helpful guide on capturing waterfowl. DO NOT attempt to capture or transport an animal unless you believe it is absolutely critical to his health and survival. For an injured animal, the shock and fear associated with being handled may be enough to kill him. Further, a frightened animal can cause you harm. DO NOT attempt to capture or transport rabies vector species, including foxes, skunks, raccoons, groundhogs, and bats, without specific instruction from an expert. Even a small scratch can result in a fatal case of rabies and will almost certainly result in the animal being killed to determine whether or not she has rabies. Please understand that the risk of disease accompanies handling most animals. Rodents, for instance, may carry a host of communicable diseases. Exercise the utmost caution when handling or capturing an animal. Try to minimize direct contact with the animal. Always wear protective clothing, including gloves and long sleeves to protect against bites and scratches. Find a well-ventilated, enclosed box or animal carrier and line it with something absorbent, including newspaper, clean sheets, or t-shirts. Refrain from using garments with loose knit or frayed edges, as these can actually be harmful to the animal. With a cloth or t-shirt in hand, approach the animal from behind and gently but securely grab hold of her. Keeping the animal covered minimizes stress and keeps you protected. Then carefully place her in the box or carrier you have chosen. If you are trying to catch a bird, butterfly nets can be useful. Place the box or carrier in someplace quiet and dark. DO NOT handle the animal unless absolutely necessary, as this causes stress and can lead to shock, and potentially death. If you are unable to transport the animal, place a heating pad underneath half of the box, though you should not do so on a hot day. DO NOT feed or give water to the animal. Forcing an injured animal to drink water could kill her, and if she gets wet she could suffer hypothermia and die. Refrain from administering any type of treatment unless the animal is bleeding severely. In such a situation, apply steady, gentle pressure to stop the bleeding. DO NOT apply a tourniquet. Once you are ready to transport the animal, place the carrier on the floor of your car, and keep the car warm and quiet. Avoid sudden stops and sharp turns. DO NOT let anyone, especially a child, hold the animal in his or her lap during the trip. If the animal is too large or too heavy for a carrier, simply wrapping him in a blanket and placing him in a stable location – such as the back of an SUV or van – may be the best option. Some rehabbers will assist with transportation. In Colorado, the Division of Parks and Wildlife trains and manages volunteer wildlife transport teams. Call (970) 389-5203 for more information. Animal Help Now wants to hear from you! Please contact us if you have information regarding wildlife transportation services in your state or region. I'm challenged with a wildlife conflict (deer in garden, skunk under porch, etc.). Please help! Where can I find established humane wildlife control standards? Where can I find additional wildlife conflict resources? Why are humane solutions to wildlife conflicts better for consumers than hiring a traditional pest/wildlife control company? 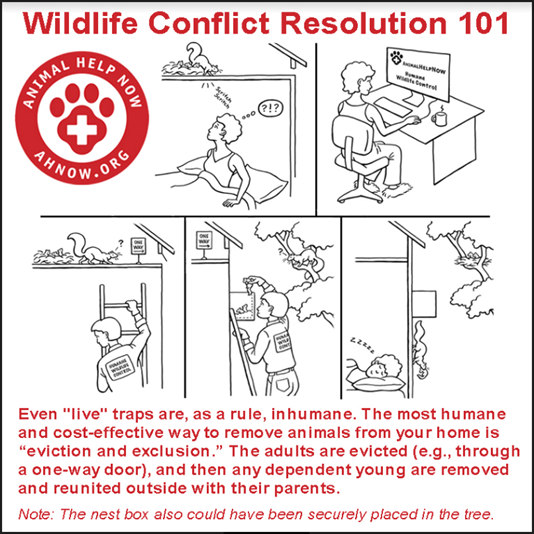 Are live trapping and relocation humane? There are no humane wildlife control operators in my area. What do I need to know before hiring a traditional operator? All wildlife conflicts can be managed humanely, but help and resources used to be hard to find. 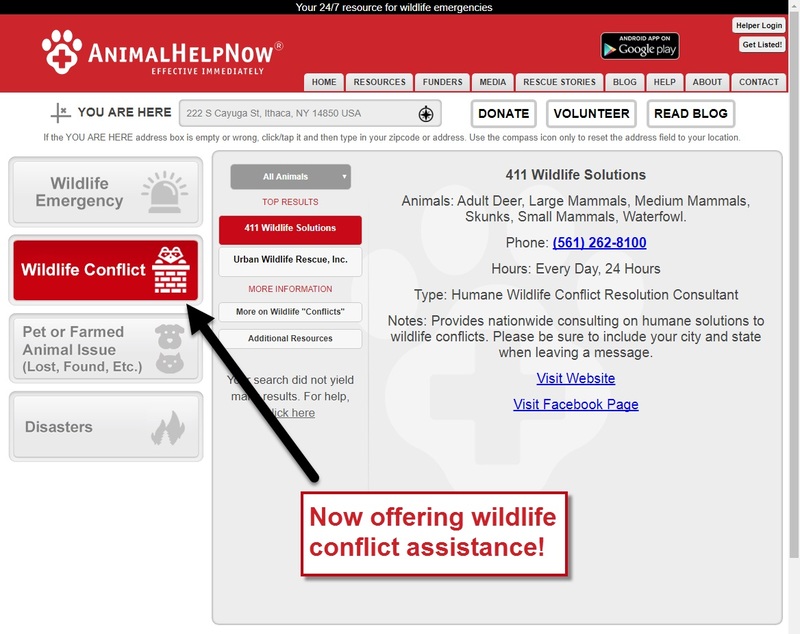 Animal Help Now is committed to providing easy access to cost-effective, long-term solutions to human-wildlife conflicts. That’s why we recently added Wildlife Conflict assistance to our app and will continue to add resources here. The Humane Wildlife Control Operators (HWCOs) and Humane Wildlife Control Consultants (HWCCs) listed in our Wildlife Conflicts search results are vetted through a rigorous application process and must meet established humane standards (see below). Note: Because humane wildlife control is a developing field, listings are continually growing. Here's a helpful guide on humanely removing an animal from beneath a porch or deck. Wildlife and Rodent Control Standards. BCSPCA AnimalKind Accreditation Program. Animal Help Now wants to hear from you! 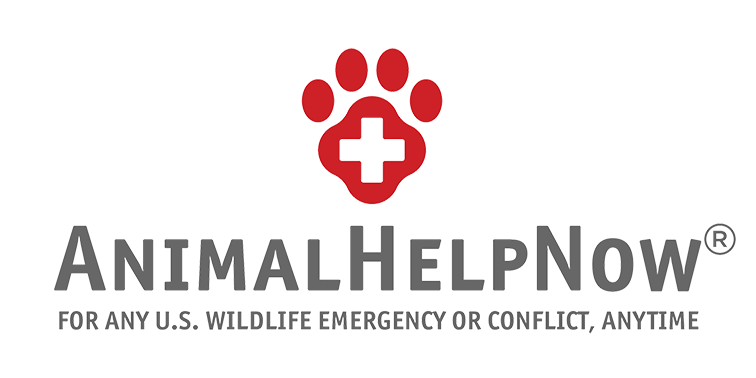 Please contact us if you have information regarding services that specialize in humanely resolving human/wildlife conflicts in your state or region. The well-being of animals may not be a priority for some individuals faced with a wildlife conflict, and it may surprise them to learn that humane solutions are also better for humans. Traditional pest/wildlife control companies often scare consumers into paying their costly fees to trap and relocate wildlife when in reality, the solution may be as simple as removing an overlooked food source. When wildlife take up residence in human structures, the tendency has been to trap and relocate the animals. Not only is this inhumane, it is an ineffective, short-term approach. Humane operators primarily use “eviction and exclusion” methods that both resolve the current conflicts and prevent future conflicts from arising. Exclusion means the animals cannot return to the structure. A word of caution: do not attempt eviction and exclusion methods without first contacting a professional humane wildlife control operator or consultant because otherwise, you may inadvertently cause other problems that are not easily resolved. Starvation because caches of food were left behind and new food sources are unknown. Exposure because den and nest sites may need to be identified and built. Serious injuries from territorial conflicts with animals who are already established in the area. Wound infections or other injuries can leave the animal unable to search for food and water. Before hiring a traditional operator, contact a humane wildlife control consultant and/or research the solution yourself – you may find a simple, inexpensive DIY solution. Refer to our FAQ: Where can I find additional resources? If you determine there are no other solutions and you must hire a traditional pest/wildlife control operator, this guide can help you find one that uses humane, effective practices and may even save you some money. How do I help prevent birds from striking windows at my home or workplace? It's hard to believe, but an estimated 1 billion birds die annually from window strikes. The good news is that each of us can take measures to bring down that number. Read this document to find out what you can do. I need help with a domestic animal issue (e.g., cat, dog, house rabbit, aquarium fish, cow, pig, chicken). I need help finding a new home for my companion animal. I need help with veterinary expenses. I need help preparing for, enduring or recovering from a disaster. I lost my companion animal (pet) and want to do everything possible to find her/him. I found someone’s companion animal (pet) and want to do everything possible to help. I need to transport an animal. What do I need to know? I need to keep a companion animal (pet) overnight. What do I need to know? I need a veterinarian but I cannot transport the animal. What should I do? An animal has ingested poison. What should I do? I have witnessed abuse/neglect and want to do everything possible to help. I have seen abuse/neglect on the internet and want to do everything possible to help. An animal is in the road. What should I do? An animal is wandering around my neighborhood. What should I do? A cat is on a utility pole. What can I do? Animal Help Now does not provide listings of common domestic animal "helpers" such as veterinarians, shelters, cruelty investigators and the like, but we do offer guidance and advice. For an emergency veterinarian, Google "emergency veterinarian". For assistance in the United States with an immediate threat to an animal’s life, call 911. For assistance in the United States with an animal-related threat to a person’s life, call 911. To report abuse or neglect, call your local law enforcement agency. In the United States, call your county sheriff. Sheriffs are prepared either to assist you directly or to connect you with other agencies that may be of assistance. For assistance with lost companion animals (pets), tap or click here. For assistance with found companion animals, tap or click here. For assistance with other pet issues or farmed animal issues, contact appropriate governmental oversight agencies or animal advocacy organizations. For assistance in the United States with situations involving animal cruelty and with rescuing animals during natural disasters and other emergencies, contact your local law enforcement agency. Adopt-a-Pet.com is a non-profit pet adoption website supported by The Petco Foundation. The free program aims to help people place companion animals with new, loving homes. Animal Help Now wants to hear from you! Please contact us if you have information regarding additional re-homing resources. Our thanks to American Dog Mag, Operation We Are Here, for much of this information. My companion animal (my pet) is lost. I want to do everything in my power to find him. Please help! Fast action is critical when an animal goes missing. If you have lost your pet, place a yard sign in front of your house, with a photo of your missing pet and your phone number. People who find a pet often walk or drive around the area, trying to find his or her owner. Call all area animal shelters and animal control agencies. If an animal is lost due to a disaster (hurricane, wildfire, etc. ), you can also search Facebook for temporary pages set up to reunite animals with their guardians. Use keywords such as "lost and found animals" or "lost and found pets" along with words that describe the location or name of the disaster (e.g., "Lost and Found Pets Black Forest Wildfire"). If your cat is lost, try putting his or her litter box outside. Sometimes cats get spooked and disoriented, but because they can smell their boxes from a distance, this trick may help their way back home. Print and distribute posters with the words “LOST DOG”, “LOST CAT”, etc. in large lettering at the top. Include a large photograph, the animal’s name, and a photograph or physical description. Don’t rely on simply listing the breed of the animal, as many people will not be familiar with certain breeds. Offer a reward, but do not mention the amount. Also be sure to include your phone number. Also consider placing a “Lost” ad in your local newspaper the morning after your companion animal goes missing. You may wish to distribute notecards to individuals in the neighborhood. Place them underneath your neighbors’ doors or on the windshields of their cars. If you have recently moved, consider doing the same thing in your old neighborhood. Some animals have an uncanny ability to find their way "home". Speak to anyone you see about your lost companion. Ask them to look inside outdoor buildings such as sheds and barns, as the animal may be afraid and looking for places to hide. Also try to search the neighborhood with family and friends, calling your companion animal’s name. Be aggressive and proactive in your search. Check local shelters by visiting them; do not assume staff members know your animal well enough to distinguish him from the rest. Call all local police and state troopers, all boarding houses, dog training clubs and groomers, and the highway department. Call veterinarians and animal hospitals both in your area and in all surrounding areas; often someone will find a stray and drive many miles to a clinic. If you find your companion animal outside and she appears afraid or hesitant, do not chase her. She is likely much faster than you and will escape. Instead, sit on the ground and speak in a normal tone, calling the animal’s name and saying familiar words and phrases. It is important to have clear photographs of your companion animal on hand in case you need them. Always make sure the animal is wearing a collar and tags displaying current contact information. I found someone’s companion animal (pet). What are all the steps I should take to be sure I reunite her with her guardian (owner)? Warning: Handling an animal can be dangerous to you and harmful for the animal. We urge you to exercise caution and good judgment when handling an animal. Be sure to look closely at any tags on her collar. Make a note of any identification numbers, and dial any phone numbers you find. Be sure to notify the shelter or shelters in the area in which you found the animal. If you are concerned the animal may not be claimed and therefore don’t want to take the animal to a shelter, you should still contact the shelter in the location the animal was found and file a “home” report. In addition, the TagTrace website has helpful hints about how to make full use of tag information. And if you see a QR barcode (see the BarkCode website for more info) on a tag, scan it with your smartphone, if possible. Further, www.lost-petz.com offers an iPhone app for pet Amber Alerts. If the animal was likely lost due to a disaster (hurricane, wildfire, etc. ), you can also search Facebook for temporary pages set up to reunite animals with their guardians. 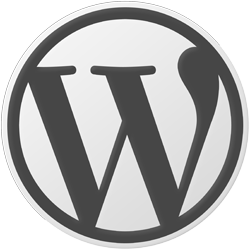 Use keywords such as "lost and found animals" or "lost and found pets" along with words that describe the location or name of the disaster (e.g., "Lost and Found Pets Black Forest Wildfire"). Note: Very few resources are available for found farmed animals. If you find a farmed animal in Colorado, contact the Larimer County Humane Society or the Animal Action Network. If you find a farmed animal elsewhere, contact an animal advocacy organization. If the animal is injured, call an emergency veterinarian to ask for advice about how to care for the animal. If you are unable to reach a clinic, or need additional advice, follow these instructions. If you take the animal to a vet, be aware that you may be financially responsible for her care. Veterinarians in Animal Help Now results have not agreed to provide free vet care. If you turn a found animal over to a shelter or an animal control agency, you will not be financially responsible for their care. Because an injured animal may be in a great deal of pain – and when in pain even the gentlest animals can act unpredictably – you must take care to protect yourself against bites and scratches. Even if you know the animal, she can still pose a danger to both you and herself. Keep your face away from any injured animal’s mouth and claws. Before attempting to move an injured companion animal, check to see if she is conscious, breathing, or bleeding. If a cat or dog is not breathing, nose to mouth resuscitation can be administered by sealing the mouth and lips shut and breathing into her nose to inflate the lungs. If the animal is bleeding profusely, apply direct pressure to the wound with a shirt or cloth. Wrap the animal’s head in a cloth, towel, or shirt. This serves to minimize stress on the animal, and helps keep you from getting bitten. NEVER muzzle a vomiting animal, as this could cause her to choke and die. Cats and other small animals can be wrapped in towels to restrain them, but make sure not to wrap the animal so tightly she experiences pain or difficulty breathing. Fractures are common in traumatic situations, so it is important to be VERY careful when moving an injured animal. Place the animal on a board, door, or any solid surface before moving her. DO NOT try to splint a broken bone unless instructed to do so by an expert; this can lead to further harm to the animal. Bring the animal to a veterinary facility as soon as possible, but make sure to call as far in advance as possible to let them know you need emergency care. Place the animal inside a portable carrier during the ride to the shelter. Because all animals respond differently to traveling inside a moving vehicle, this is one way you can minimize the risk of the animal becoming upset and unmanageable. If you do not own a carrier, you may be able to fashion one out of a box or plastic tub. Make sure that it has large enough holes or open spaces to allow the animal to breathe. Once the animal is inside the vehicle, strap the carrier to the center seat in back with a seatbelt. If the carrier is too large for a seatbelt, place it in a stable location in the back of an SUV or van with a safe, strong, wire mesh installed between the cargo and seating areas. This will prevent the animal from distracting you while driving or from being thrown into the front seat in the event of an accident or sudden stop. If you are unable to provide a carrier of any kind, or the animal is too large or too heavy for a carrier, you may place him in the cargo area. WARNING: DO NOT place the animal in the bed of a pickup truck. This is unsafe for the animal and a potential safety risk for other drivers. If you are unable to move the animal because you do not have access to transportation, first call the shelters in your area to find out if they have staff that can pick up the animal. If they are unable to assist you, some companies specialize in transporting animals, including www.TLCPetTransport.com and www.animalsaway.com. Your objective when transporting an injured animal is to ensure that no further harm comes to him, and that your safety and the safety of others is not at risk. It is best to wrap the animal in a blanket or cloth and place him inside a portable carrier for the ride to the vet. Because all animals act differently when traveling inside a moving vehicle, this is one way you can minimize the risk of the animal becoming upset and unmanageable. If the animal is too large or too heavy for a carrier, simply wrap him in a blanket and place him in a stable location, such as the back of an SUV or van. It is best to use a vehicle that has a safe, strong, wire mesh installed between the cargo and seating areas. This will prevent the animal from distracting you while driving or from being thrown into the front seat in the event of an accident or sudden stop. If you have found a companion animal and you must board her overnight, be cautious and make sure to protect yourself from potential harm. Even animals that seem friendly may exhibit unpredictable behavior in unfamiliar situations. Protect yourself against bites, scratches, and disease by minimizing contact with the animal and wearing protective clothing such as gloves and long sleeves. DO NOT allow children near the animal. Minimize stress on the animal as much as possible. Have you tried contacting a mobile vet? To do so, go to the home page, tap or click the Pet or Farmed Animal Issues link, indicate that you cannot transport the animal, and answer the subsequent questions. Your results will include all nearby mobile veterinarians. Be sure to leave a message if you cannot reach the veterinarian. Many mobile veterinarians use their voice mail to handle all incoming calls. Many operate in remote areas with limited coverage and depend on cell phones. You also may wish to call an emergency veterinarian and ask for advice about how to care for the animal. If you are unable to reach a clinic, or need additional advice, follow the instructions below. Be cautious, even if you know the animal. She can still pose a danger to both you and herself. An injured animal may be in a great deal of pain, and the actions of even the gentlest animals can be unpredictable. Take care to protect yourself against bites and scratches. Keep your face away from any injured animal’s mouth and claws. I can’t get an animal to a vet. What do I do? We do include mobile veterinarians in our results. If you don’t see one, go to the home page, tap or click the Pets and Farmed Animals link, indicate that you cannot transport the animal, and answer the subsequent questions. Your results will include all nearby mobile veterinarians. An animal has ingested poison. Always bring the animal to a veterinary clinic and consult a poison control hotline if you suspect an animal has ingested a toxic substance. Be aware that hours or even days may pass before an animal shows symptoms of poisoning. Remember to get help as soon as possible. The difference between life and death could be determined by seconds or minutes. Your veterinarian will likely be able to provide assistance and/or advice about what to do in this situation, but you also may call the Pet Poison Hotline (800) 213-6680 or the ASPCA Animal Poison Control Center, (888) 426-4435. There will be a fee attached to phone consultation at poison control centers. Collect as much information as possible about the substance ingested, including a sample and/or ingredient list of the poisonous material, as well as any material the animal may have vomited or chewed. Doing so may provide the information a veterinarian needs in order to treat the animal. I have witnessed (or am witnessing) cruelty or neglect. What can I do to ensure I’m taken seriously? Write down what you witnessed, including dates and times. If possible, document the incident using photography or video. When filing a report, be sure to note all agencies you contacted, the names of the persons you spoke with, and the details and outcomes of your conversations. To get help for animals involved in domestic violence, see RedRover.org/Domestic. Animal Help Now recommends calling 911 for dogs left in hot cars. RedRover has an excellent website devoted to this issue, mydogiscool.com. Visit this site for fliers, other literature and helpful educational ideas. I am concerned about animal cruelty depicted in photographs, videos or on the internet. If you are offended by images or scenes depicting animal abuse or cruelty in a movie or television show, your best course of action may be to contact the network or publisher responsible for the content. Unfortunately, many such depictions are considered constitutionally protected free speech. You also may wish to contact the American Humane Association Movie and Television Unit, which oversees the use of live animals in television and movies. If you know of a website that displays videos depicting cruelty to animals, file a report with the Federal Bureau of Investigation or the Department of Justice. If possible, get screen captures of the content. If you encounter an animal in the road or on the shoulder while driving and you have time to avoid hitting her, tap your brakes (so your brake lights flash), sound your horn, and flash your headlights to scare off the animal and to warn other drivers behind and in front of you. If you are driving through an area where animal traffic is likely, be especially careful at dusk and dawn, when many animals venture out to eat. At night, use your high-beams as often as possible, and try to be aware of any activity alongside the road. If you spot a deer in the distance, flash your lights on and off several times. Deer fixate on headlights, so this may cause the animal to flee. If you encounter a herd of animals in the road, call 911 or contact the county sheriff. If you won’t be putting yourself at risk, attempt to frighten the animals off the road. The general approach to unfamiliar dogs is to see if you can get the owner's (guardian's) information from tags on the collar and to get the animal into a confined space such as a fenced-in yard. If you sense the animal may be dangerous, contact law enforcement/animal control immediately and consider alerting your neighbors. If you have exhausted the options provided to you through the Animal Help Now program, including attempting to enlist the help of an animal advocacy group, here are some things you can try. Look around to see if anyone has reported a lost cat matching the cat's description. Sometimes a utility company will help by providing staff, vehicles, nonconductive extension poles and other safety equipment. They don’t usually provide this service but sometimes will if there is enough public outcry of concern for the cat. Some fire departments respond to these calls, but this is the exception and not the rule. When contacting animal control or fire departments, it might not hurt to try a few times as it's possible you will reach a different dispatch operator, one who's more sympathetic to cats. If someone has a connection to the cat, that might assist in a public awareness campaign and might compel the fire department or animal control to help out. A tree trimmer truck with hydraulic bucket is also a possibility. Some heavy equipment rental companies may be willing to help. Another option is to park a recreational vehicle (RV) or other high-profile vehicle next to the pole to decrease the distance the cat would jump or fall. You may also try contacting professional tree climbers, professional tree trimmers, and reaching out to your local climbing gym. Other options include holding a net (sheets, blankets, beach towels, etc.) and forcing the cat off the perch. A more passive approach is to put padding (mattresses, towels, pillows, etc.) around the base of the pole to cushion the cat's landing if he/she jumps or falls. You might also consider building a platform on a low branch to assist the cat coming down. Smelly food may tempt the cat off the perch, but it also may attract wildlife or other animals that might deter the cat from coming down. Very little is known about the effectiveness of putting out food for a cat in a situation such as this. If you need to generate public support, take photographs and distribute fliers. I need to evacuate animals from my home/property. Please help! I lost/found an animal during a disaster. What should I do? How can I best prepare to protect my companion animals in the event of a house fire or other catastrophic event at my home? In preparing for or responding to a disaster, it is your responsibility to evacuate your animals. The responsibility for coordinating animal evacuation and sheltering before and during a disaster falls to the local government in charge of the incident. Should the local government order animal evacuation or make sheltering available, notice to the public should be provided on local television, radio or your local government’s website. If you need help evacuating animals, look to local television, radio or your local government’s website right now for assistance. Secure your animals in a cage or carrier and get them away from danger. Be sure to keep your pets contained on a leash or in a carrier at all times to prevent them from running away. Keep identification including collar, ID tag and pet license on/with dogs and cats at all times. Take along any medications and if possible the food your animal eats. For temporary shelter, check with your local government or contact kennels, nearby hotels/motels that accept pets, or friends or relatives outside your immediate area. This page contains additional tips on finding pet-friendly accommodations. Our thanks to RedRover and the Humane Society of Boulder Valley for much of the content in this answer. For help with animals lost during/after a disaster, click here. For help with animals found during/after a disaster, click here. Be sure to read all the way to the bottom of the topic. Animal shelters and law enforcement agencies that may be helpful if you have lost or found an animal during or after a disaster (a discussion of lost and found companion animals is in the next section). Microchip your pets. Make sure your pets are microchipped and wear collars and tags with up-to-date information. Microchip identification is one of the best ways to ensure that you and your companion are reunited if you have been separated. Be sure to keep the microchip registration up-to-date, and include at least one emergency number of a friend or relative who resides outside of your immediate area. Post a rescue alert sticker at entrances to your home. Make sure they would be visible to rescue workers. Each rescue sticker should include the types and number of pets in your home, as well as the name and phone number of your vet. Free emergency pet alert stickers can be found online. Create an annual reminder on your calendar to keep your stickers current. Arrange a safe haven for your pets. This might be a kennel, a local animal shelter, a nearby hotel/motel that accepts pets, or friends or relatives outside your immediate area. RedRover provides tips on finding pet-friendly accommodations, as well as additional resources for disaster preparedness. Use the buddy system. 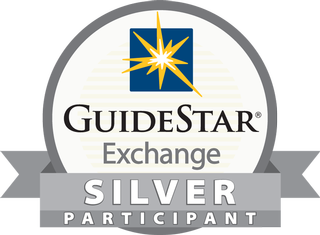 Exchange pet information, evacuation plans and house keys with a few trusted neighbors or nearby friends. If you’re caught outside evacuation lines when an evacuation order is issued, your neighbors or friends can evacuate your pets for you. Keep an emergency supply kit ready at all times. Be sure to have good photographs of your companion animals in a safe place (preferably online or on your phone). If your companion goes outside, or stays inside and doesn't mind wearing a collar, make sure the tags display your current contact information. Sign up for emergency alerts in your state, county or municipality. As an example, Coloradoans can sign up for alerts here. If you are trying to help wildlife during or after a disaster, use the Wildlife Emergency button on the Animal Help Now home page. Rescue Kit – For Car or Home! Pillowcase for transport of snakes. According to snake-removal.com, this is a good method: "Throw your shirt or a light blanket over the snake and scoop the snake up, placing the shirt and snake into the pillowcase." If you are not familiar with snakes, be extra cautious if you choose to handle them. First aid kit (see, for example, this inexpensive Red Cross product). For snakes: Pillowcase for transportation. Be sure to have permanent and secure housing for him when you reach a safe place. The Humane Society Veterinary Medical Association offers this popular publication, inspired by veterinary offices requesting information about how to temporarily treat and care for injured and orphaned wildlife. How to transport an injured cat. How to care for an injured bird. How to handle an injured ferret. How to move a snapping turtle. Animal Help Now began in Colorado and then expanded to Texas, before expanding its wildlife emergency functionality across the United States. A person can work for animals in a number of ways, and the opportunities will only increase as humans increasingly understand animals and their needs. Wildlife biologists study animals in their natural habitat. One of them works in the conservation department at a zoo. Many if not most zoos direct a percentage of their budget - some a very small percentage and some as high as perhaps 40%! - to study animals in their native habitat in an effort to protect native ecosystems. Other wildlife biologists work for advocacy organizations, which raise public awareness about threats facing wildlife and sometimes bring lawsuits or help craft legislation to help animals. Some wildlife biologists work for government agencies. Animal behaviorists (or “ethologists”) study animal behavior. Jane Goodall is an ethologist. So are Marc Bekoff (who studied coyotes and taught at a university) and Con Slobodchikoff (who has extensively documented the language of prairie dogs). Many people work as veterinarians, veterinary technicians or wildlife rehabilitators. Some lawyers put their degrees to work for animals. Animal law is an up and coming field. The Animal Legal Defense Fund is an organization dedicated to helping animals in the legal arena. Thousands of people find positions in organizations that advocate for animals, including the Humane Society of the United States, People for the Ethical Treatment of Animals, Farm Sanctuary, and others. Positions at these organizations are the same as at any business, including administrative staff, graphic designers, accountants, public speakers, lobbyists, etc. Some people teach animal-related classes at universities. Many people work at animal shelters, as dog trainers, etc. And several people hold regular jobs but volunteer their free time to help animals! Our thanks to Professor Leslie Irvine for much of the following information. Animal Help Now offers a wide range of free educational and promotional materials to help you help animals. These informative publications are available for both online sharing and for posting/displaying in public areas. To see the complete Animal Help Now catalog, click here. Here are just a few examples of what you'll find in our online catalog. 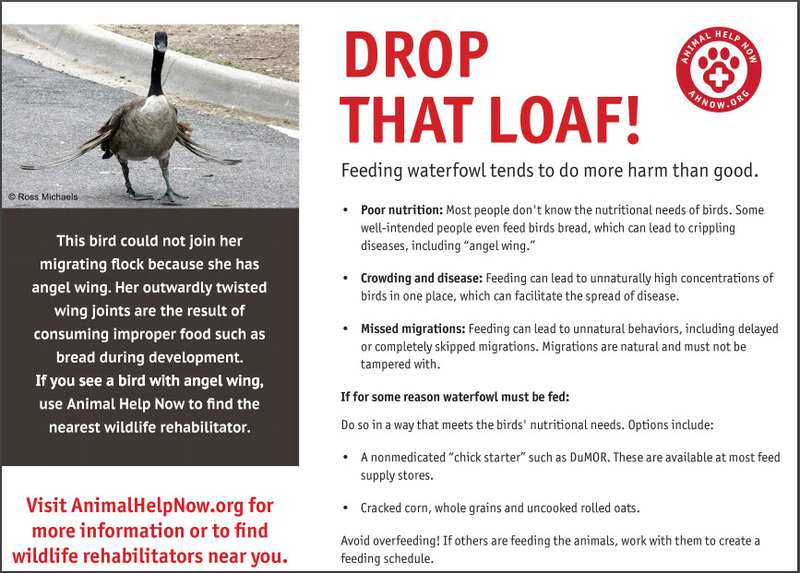 Help save ducks and geese! Print these posters and put them up at local ponds and lakes. If you get them laminated they'll last a lot longer! Share graphics provide a succinct overview of the kinds of situations in which the Animal Help Now app can provide assistance. Posting these images to your social media pages and encouraging your followers to share them is an easy way to educate the public and help spread the word about AHNow's lifesaving app and website. 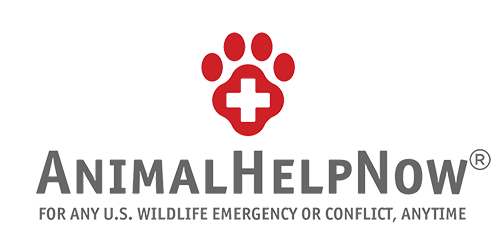 Visit AnimalHelpNow.org for assistance with wildlife emergencies throughout the United States. Please visit our feedback page to let us know how we can improve this content. Copyright © 2019 Animal Help Now. All Rights Reserved.